Happy Columbus Day everyone! And what better way to celebrate the Holiday than to share one of the Bartolini Clan’s favorite holiday recipes. Say the word “ravioli” to any of the old 2-flat’s former residents and you’re sure to conjure up memories of holidays past, specifically Christmas, New Year’s, and Easter. No matter which of the 2 dinner tables you visited on those evenings, there would be a large platter of ravioli taking center stage. (It was present on Thanksgiving, too, but The Bird was the star of that show.) As a kid, my attention was pretty much focused on that platter of pasta pillows — and dessert, of course — and I think the same would have been said by everyone at the tables, save Mom and Zia. Their perspectives would have been entirely different. One must remember that in those days, the only freezer available to most households was a small compartment above the fridge. Consequently, if you wanted to serve your family ravioli, you made it the same day it was served. Well, there was absolutely no way that Mom and Zia were going to start making ravioli on a holiday afternoon. That meant that most holiday mornings, they were up at 5:00 am making ravioli for that evening’s holiday dinner. And then there was Christmas. We were allowed to get up during the night to discover what Santa had brought us and to play with our toys. It wasn’t until years later that we learned how our parents no sooner got the gifts wrapped and under the tree when we came charging out of our bedrooms. Mom and Zia were lucky to get a couple of hours of sleep before they started making ravioli. And they weren’t making just a few ravioli. They made enough for everyone at each of the two holiday tables, which often included guests as well as each family. For Mom, that meant ravioli for as many as 12 people. To this day, I don’t know how they did it. The purchase of a pasta machine changed all that. Unable to make the large pasta wheels, Mom turned to ravioli dies to make her ravioli. Pictured just below is my collection. 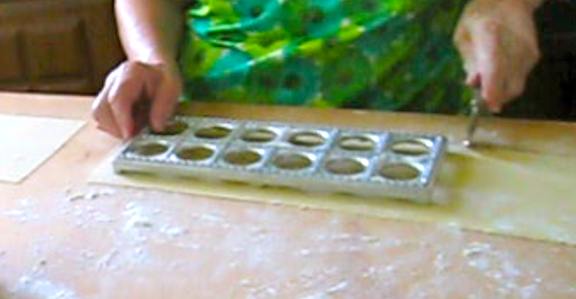 The 2 dies on top are used for ravioli. The one on the top-left makes ravioli that are 2 inches square. That’s just about the size The Sisters were taught to make by hand. 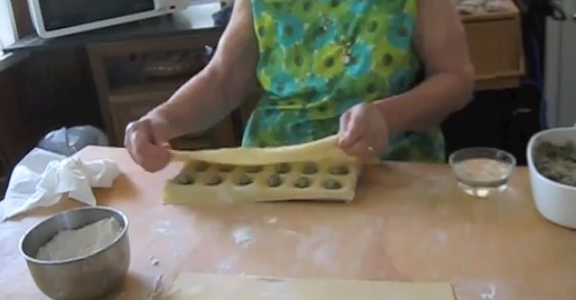 The ravioli form on the top-right makes ravioli that are 1.25 inches square. That’s about the size The Sisters made by hand once we kids came into the picture. (Kid-friendly ravioli. Who knew?) 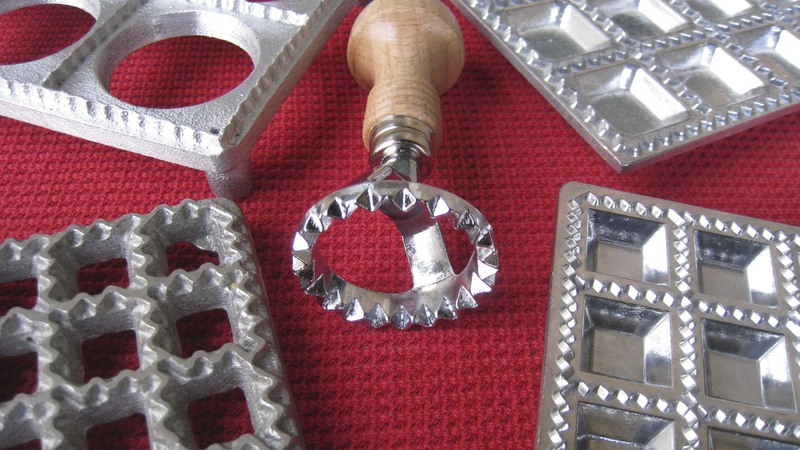 The remaining 3 are used for soup ravioli, which Mom called cappelletti, “little hats.” Though normally rounded, some look similar to tortellini, the die Mom used (lower left) was .75 inches square. As a result, the word “cappelletti” in our house wasn’t used to describe the pasta’s shape but its use — and that was in soup. Mom gave me her cappelletti die years ago but it’s too small for me to use in any way. (I’ve tried several times but, being ham-fisted, I cannot make the filling “balls” small enough to fit the die.) So, I bought the die on the lower-right. 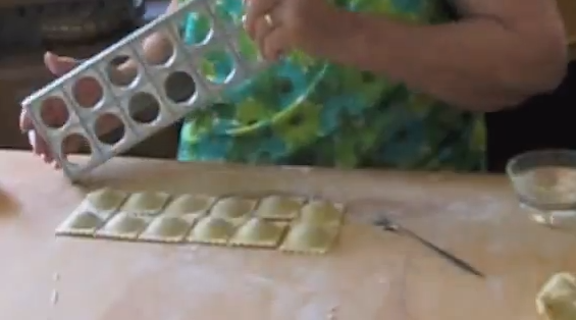 It makes raviolini that are 1 inch square and I use it to make my cappelletti. In the center is a press that makes traditional-looking cappelletti, each 1.25 inches in diameter. I, also, have 2 more ravioli makers, both not shown, but they don’t work very well. One attaches to my pasta machine and the other to my stand mixer. In both cases, they require that the dough sheets be about twice as thick as I am accustomed to using. The result is ravioli that is a bit more chewy than I prefer. What can I say? Mom spoiled us. When it come to the pasta dough’s final thickness, let your own palate lead the way. Our pasta machines are calibrated from 1 through 10, with 1 being the thickest setting. Zia prefers to roll her dough up to and including the number 6 setting. I will use the same setting for large ravioli but for the smaller ravioli and cappelletti, I’ll roll the dough one more time, using the number 7 setting. Once you’ve made the filling and pasta dough, creating the ravioli is easy enough, though time-consuming. 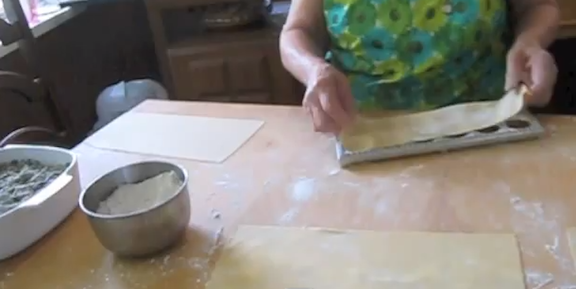 Here’s Mom’s Pasta Dough recipe and, on Wednesday, I’ll share the recipe for their ravioli filling. (Future posts will share the filling recipes for sausage ravioli and cappelletti, as well as a few others we’ve tried along the way.) The pictures that follow will guide you through the ravioli making process far better than I ever could describe. Of course, it helps that they feature that world-renowned still photo model, “Zia,” in a sequence of never seen before shots taken where she lives, along the fabulous Michigan Riviera. Ah, the life of the octogenarian super-model! Ravioli normally take 5 – 8 minutes to cook, a couple of minutes more if frozen. Cooking times may vary depending upon the thickness of your dough, the filling, the size of the pot, etc. Taste one to insure they are done to your liking. Once the ravioli are cooked, carefully drain using a colander or sieve. You can use a Bolognese-style sauce or go meatless. The method I’ve described is by no means the only way to make ravioli at home. Check out the Rufus’ Food and Spirit Guide to see Greg make ravioli completely by hand, similar to the method Mom employed but on a smaller scale. You can also see a slightly more modern approach by going to Sweet Caroline’s Cooking. With Thanksgiving just around the corner, her recipe for butternut squash ravioli couldn’t be better timed. 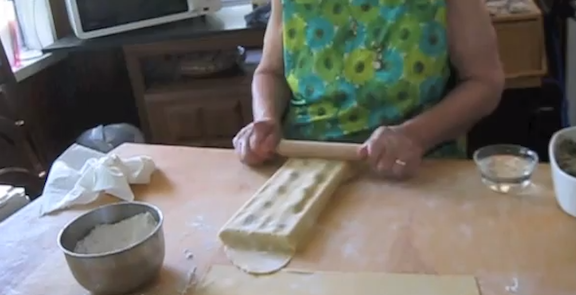 Lastly, in an upcoming post, I’ll show you yet another method for making stuffed pasta. You’ll note that Step Ten instructs that only meat-filled ravioli should be lightly punctured. This should be done if you intend to freeze the pasta. Doing so will allow any air sealed within each raviolo to escape during the cooking process. Too much trapped air will cause the raviolo to, in effect, balloon and it may burst before the filling can thaw and cook. We use the tines of a cocktail fork to do this but we don’t puncture cheese-filled ravioli. The cheese filling will often leak through the puncture holes. Try to fill each pillow with as much cheese filling, and as little air, as possible. This “balloon effect” should not be a problem if the ravioli are fresh (not frozen) when cooked. Although not especially difficult, this is a time-consuming process. I’d recommend that you make enough for a couple of dinners and that you freeze what you won’t be using immediately that day. It’s easy enough. Place your freshly made ravioli in a single layer on lined baking sheets and into your freezer. 2 to 3 hours later, place the now frozen ravioli into bags or containers and return to the freezer. When needed, do not thaw before placing into boiling water, reduce to soft simmer, and cook till done to your liking, normally a few minutes longer than if freshly made. And for heaven’s sake, keep an eye on Max at all times! This entry was posted in Family Recipes, Holidays, Home-Made Pastas, Make It Yourself, Pasta/Rice/Soups (Primi Piatti) and tagged family recipes, Food, Italian, Recipes by ChgoJohn. Bookmark the permalink. I just feel good when I read your posts!! Those pictures are priceless, the hustle you describe of the holidays brought back so many memories. And Thanksgiving would not be complete if the bird didn’t have pasta as a first course! Unfortunately, I should turn in my Italian card because I don’t make pasta from scratch; I think I would if I have family around to spend a day in my kitchen; that would be so much fun!! Thanks, Linda, Zia and I both appreciated your comments. If I were still working, I doubt if I’d make nearly as much pasta as I have time to do now. Besides, as a busy working Mom, if you found time to make pasta, you wouldn’t have time to make biscotti. That would be a crime!!! Bravo! Excellent how-to and priceless pictures. I can only imagine how many ravioli those hands have made. Thanks, David. It really is too bad that there aren’t any pictures of The Girls making pasta or ravioli. It just wasn’t considered “special” enough. Unbelievable, eh? This is the first description/recipe for making ravioli that seemed to really make sense for me. I’ll have to pick up the tools and try this. My family loves ravioli and I would love to make it from scratch. Thank you so much. Your comments mean a lot to me. This blog is intended for the youngest members of my family, those too young — or not even born yet — who will never have the benefit of watching Grandma or Great-Grandma make these dishes. If I break the recipes down into simple steps, they may be willing to give ’em a try. Well, that’s the plan anyway. Again, thanks! Why is it I get so hungry after reading your blog. Fabulous post – I never really understood how the ravioli dies worked. Great words, great pictures ( the main one because of the background material, and the sequence because they tell a story) and delicious end result. I love the tutorial photos – I’ve always wanted to make pasta from scratch, and this does make it seem possible for me. I hope the youngsters in your family feel the same! Until very recently, we had a really good shop in town where I could buy homemade ravioli. The old man wanted to retire, and the kids didn’t want to keep it going, so they’re gone now… With a little help, I *might* be able to make my own now! It does seem daunting, at first, but once you get going, it really isn’t at all difficult. And the pay-off is well worth the effort. Besides, I’ve read your recipes and seen the results of your canning. If you can master those, you can certainly make ravioli. Try it, you’ll like it! Now I want to do this all over. I love those molds. And I always love how your best memories are tied to such wonderful meals! Thanks, Greg. I wish I could make them as you do, completely by hand. I’ve tried to do so and it takes me far too long, especially if I wish to make enough for myself and dinner guests. Either way, though, I’m sure you’d agree that nothing beats homemade!. Those pasta tools and molds are fantastic! Your homemade raviolis are much more perfect than mine. I use the Kitchen Aid pasta maker attachment for the dough, then just lay the dough sheets on the counter and spoon filing on top. But your way is much more efficient. Great job, these sound delicious! Happy Columbus Day to you as well….if only I didn’t have to come to work today, ha! Sorry you have to work on a HOLIDAY!!!!! We, too, use my KA pasta roller attachment. I bring my stand mixer with me to Michigan. Never know how it will be used, just that it will be. Your squash ravioli sound delicous and look great! If i could make ’em as good as yours or Greg’s look, I never would have bought the dies. What great instructional photos, John. 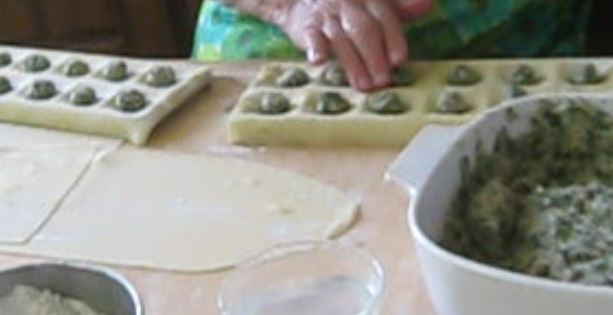 I love making ravioli too, I have the small square and the round one in the centre of your photo (I picked it up in Little Italy in New York City, along with my gnocchi paddle!). I don’t have the attachment for my stand mixer, and if I made ravioli more often, I might put it on my Christmas Wish List. I am looking forward to the fillings in the coming days. Thank you, Eva. I, too, have a gnocchi paddle, although Mom & Zia thought it a waste of money. (It cost under 5.00.) They “grooved” their gnocchi using the back of a fork and saw no reason to upgrade. This is the time of year when I start making ravioli. It’s definitely because of my upbringing; holiday dinners don’t seem “right” if ravioli isn’t the primo piatto. I hear you John. My mom used to make an amazing cold cherry soup, and this year, we simply forgot. It just didn’t seem like a Thanksgiving dinner without it. 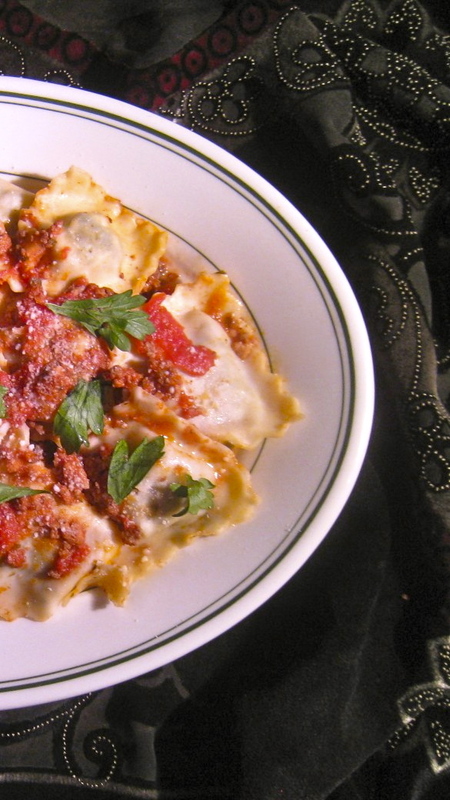 I have a confession to make – I’ve never made homemade pasta! But with your very clear and complete instructions I think I can! Let me just say I love all your stories – and they almost always correspond with food – so much like our family, but without the Italian influence! Food and good memories just go hand in hand, don’t they? You are so right: memories and food do go hand in hand, especially in my family. So much of our family life was centered around the kitchen and table. We didn’t realize just how lucky we were. As for the pasta, it’s just like anything else. Practce makes perfect. You’ll be amazed at how tasty the results are, even after your first batch. Give it a try! You are so very welcome! Once you get the die(s) and settle on a filling recipe, you’ll amaze yourself. There’s nothing so tasty as that first dish of ravioli that you made with your own hands. Feel free to send an email if you’ve any questions/problems and, by all means, let us know how it goes. Good luck! I love traditions, this looks so delicious! Homemade is always better–always. Yes, homemade is always better. I’m very lucky to have had women in my life who were such talented cooks and, more importantly, patient teachers. The photos look fine to me, showing ACTION of the making. I have never made ravioli or pasta either but your blog and words inspire me. I purchase mushroom ravioli or artichoke ravioli from our Groceria Italiano where you can see the women make them sometimes. But of course, yours would taste the absolute best. Thank you, Ruth. you are very lucky to have a store where the pasta is made on-site. That’s very often just about as good as homemade. Even so, making pasta at home is far easier than one would think. And once you taste your first dish of pasta that you made by hand, you’ll be hooked. Yes, Celi, that’s right. We ravioli makers are a cruel lot, out to stymie the efforts of dieters everywhere! Being the kind-hearted ravioli-maker that I am, however, I tried to warn you. I told you that the “No Flour” rule just wouldn’t do. I almost lost my union card over that. (I told you they’re a mean lot.) Well, as you say, it’s only 2 weeks. Perhaps you should only read my posts’ titles until you’re off this self-imposed fast. I have to go … I hear footsteps. Oh man that looks good! But I am entirely toooo lazy to ever try this on my own. Perhaps I shall partake of some toasted ravioli when I go back home or at least hit up Charlie Gitto’s. Yum! Happy Columbus Day to you too! For us is the the national day (and at home Pilar’s day, because is also the day of Our Lady of the Pillar). This post is simply perfect, love the story, the pictures, the how to… congratulations and thanks to Zia! Thank you so much! This post was a joy to write, so many fond memories brought to mind. Better still, was showing it to Zia and getting her response. I hope you, Pillar, and the rest of your family enjoyed your Holiday as much as we did. This post is a treasure John! I love homemade ravioli. There is nothing better in my mind. This would make a fantastic addition to our holiday meal. I usually make an Italian dinner on Christmas Eve for the family and this will be perfect! I was always intimidated by the process, but your step-by-step really makes it seem doable. What fabulous memories you have too – thanks for sharing. They always make me smile. Thank you, Kristy. Your posts never fail to bring a smile to my face, as well. As skilled as you and your “crew” are in the kitchen, making ravioli shouldn’t be a problem at all. In fact, you’ll probably wonder why you haven’t tried to make it sooner. And yes, starting off your Christmas Eve dinner with a primo piatto of homemade ravioli would really be something! I hope you try it. Just catching up on posts myself after a trip in Cali. When I was young, my parents would hold a yearly ravioli feed for family and friends. I remember for 1-2 weeks prior to the party ravioli being made in the kitchen and how good everything would turn out (one side of the family was Italian and naturally that is where the recipe was passed down from). Sadly I’ve never made them before myself, but after reading your post I’m feeling inspired. I’ll have to make the time in the next few weeks and see what I can produce with my own hands. Thanks for sharing and inspiring…I’m off to your next post! Welcome home; hope you enjoyed Cali! You and your wife are no strangers to the kitchen, as witnessed by your posts. You could easily master making ravioli at home and I, for one, would love to hear of the fillings you’ll develop. Good luck! Hi ChgoJohn–This is a little off topic–I was enjoying your posts about ravioli making and fillings yesterday and it got me wondering if you have any special ways of preparing sausage as a topping for pizza. You if anyone would seem to know this! I don’t really do anything “special”, Michael. Whether I slice the sausages or take it out of the casing and crumble it, I cook the meat and drain it on paper towels before adding it to the pizza. This helps to keep excess grease off of the pizza and you don’t have to worry about it being cooked thoroughly. I hope this helps. It does! Thank you so much. I love this post – it was such a pleasure to read and (again) bouhgt back many memories. Weren´t the cooks in the family (usually the Mammas and the Zias) amazing in that they did so much for us? I love Zia´s modelling and ravioli making – send her a big “bacio” from Sunny Spain! Zia will be thrilled when I send her your kiss! I’ve shown her your blog and she knows that the ketchup I gave her was based on your recipe, as was the jam. She is surprised that others express interest in our recipes. I just cannot convince her — nor Mom when she was alive — just how special these recipes are. Oh, well. Your “message” is sure to bring a smile to her face and I thank you for that, Tanya. Ravioli are my favorite since I was a kid! I made fresh homemade pasta e ravioli myself during the summer (maybe you saw my post about it) as well as homemade tomato sauce. It was so great that we decided to make it a family tradition. I’ve read your fresh pasta post and I so agree with your ravioli favoritism. For me, there is nothing like it! And welcome back! I’m so glad to see you’ve returned to the blogosphere! Can we say “Foodgasm” !? In a word, you’ve just described the holiday dinners of my youth. They were amazing! Oh John, now I really can’t wait to find a die! Thanks so much for the link. So glad to be of help, Mandy. If you’ve trouble finding the dies, let me know. Maybe I can find a company over here that ships internationally. And of course, if you run into any problems or have questions, feel free to drop me a line. Good luck! Your blog is incredible! Everything is homemade and delicious! Thank you so much, Judy. We really don’t make ravioli more often than a couple, three times a year. Then we make enough to last several months, as well as to give some to family and friends. If you have a helper, things go relatively quickly. You are always so complimentary, Judy, and I do appreciate you kindness. Really good stuff here. I’ve made ravioli, but never with dies. I like this method! And I plan on making lots more pasta-based dishes next year, and no doubt I’ll be playing with ravioli! Thanks for this. Thanks, John. I find the dies the easiest way to crank out enough ravioli for a few dinners. Like anything else, though, practice makes perfect and it may take a little while to find your rhythm. I’ve found a pretty good source for ravioli-making equipment. I’m not affiliated with them in any way and, if you like, I’ll send you it’s web address. You know, if you could send that info my way I’d really appreciate it. Kitchenriffs (at) gmail (dot) com. Thanks! dies that makes 40 at a time. I’ve been looking for one for a long time. We make very small little balls of filling to fit into the spaces, a process which takes forever! But those little morsels are so delicious when you bite into them. Three or four fit easily on a soup spoon. My mother doesn’t remember where the die came from, only that she got it through a friend. Do you know of anyplace where I can still get one? I wish I had good news for you but I’ve no idea where Mom got that die, nor does my Zia, her sister. I’ve done qite a bit of shopping for ravioli dies and stamps but have never seen another like the one she gave me. I buy many of my ravioli making products here, at Fantes.com . Although I’ve not seen that particular die on their site, perhaps they might know of a place where you can find one. If I ever come across one of these dies, I’ll be sure to let you know where I found it. Hi, Karen. Those dies have saved us all an awful lot of work. Zia and I are like a well-oiled machine now and can really make quite a few in an afternoon. They can be bought at a number of cooking stores and Amazon. I’ve bought some from Fantes.com. If you’ve any questions or problems locating them, let me know and I’ll help. Superb Ravs! I had to take a course on these! I just started a food blog myself and stumbled upon yours and am enjoying it very much! Great writing! Hello! 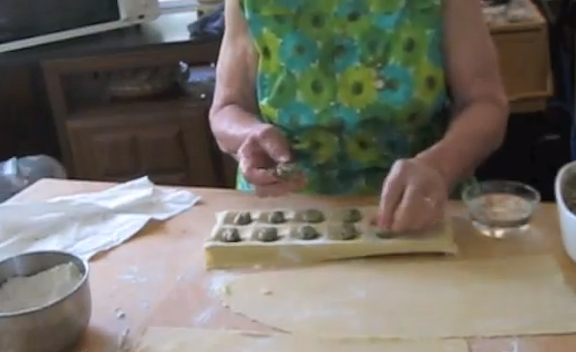 My family and I have made cappelletti ever since i could remember! With the growing of our family we’ve struggled for YEARS to find cappelletti plates like the ons you’ve pictured above! We have some, but no boxes to help us indicate what brand they were. Do you by any chance have ANY idea where i might be able to find them?! We’ve seen Raviolamp with the non-open bottom, and we’ve been searching for the open-botom ones! Thanks! PS: sorry entered wrong email before lol!! Hello, Erika. I get most of my ravioli and pasta making equipment from an online store, Fantes.com. Their prices are competitive and I’ve never had a problem with any of the orders I’ve placed. (I’m not on their payroll, either. 🙂 ) Others have asked about the smallest of cappelletti plates but I’ve been unable to find where Mom bought them. I even tried to find one when I was in Italy last May but without any luck. I’ll keep looking, though. Feel free to come back if there’s anything else I might do to help.